X-Stream is a powerful way of creating multiple streams of multimedia content and presenting them all simultaneously in a fully synchronised and re-configurable environment. It can be delivered over internet, intranet, CD or DVD. 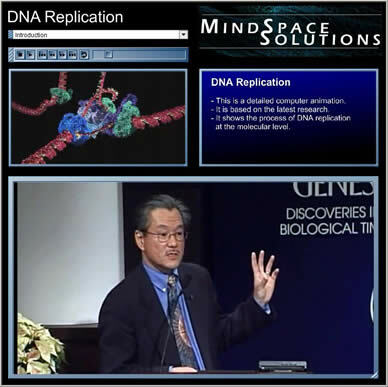 MindSpace Solutions has developed best practices for recording, processing, archiving and presenting multimedia from venues such as seminars and lectures. This currently includes the simultaneous recording and use of video and audio of the presenter (possibly from multiple angles), PowerPoint slides and other supporting resources. 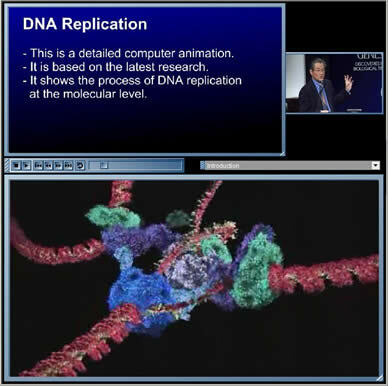 Simultaneous playback of multiple channels of multimedia (for example, one video of the presenter and another of their presentation). Independent control (positioning and re-sizing) of every element on screen for personalisation. Synchronised control (play, pause, fast forward etc) of all multimedia streams from a single VCR control interface. Easy delivery over internet, intranet, CD or DVD. The presentation can be viewed immediately on both Mac and PC with no need to install extra codecs or video players. It can be viewed on any other platform that has Flash Player 7 available. MindSpace Solutions’ X-Stream - any type of stream, any number of streams. All synchronised to a single timeline with flexible controls. Archiving can currently fit 1-2 hours of video on a CD at high quality, or up to 14 hours at lower quality. Alternatively, X-Stream can be dynamically streamed over the internet at 50mb/hour (122kbits/sec), or less if necessary. The ability to archive valuable presentations for future reference and for people who are unable to attend the original presentation provides a very powerful tool for increasing accessibility to new knowledge. As some presentations can involve considerable expense in hiring and/or transportation costs, it is very cost effective if the presentation remains available long after the presenter has left. This technology provides the opportunity to make more traditional methods of video archiving easier, more cost effective and more attractive to the end-user by presenting the information in a highly flexible and multi-streamed interface. X-Stream is applicable to all forms of presentation, including: conferences, guest seminars, lectures, speeches, meetings and special events. It is also applicable to interviews, product promotion, professional development and training. Check back soon to see some samples of X-Stream being applied to various tasks. Or Contact Us for a personal demonstration.